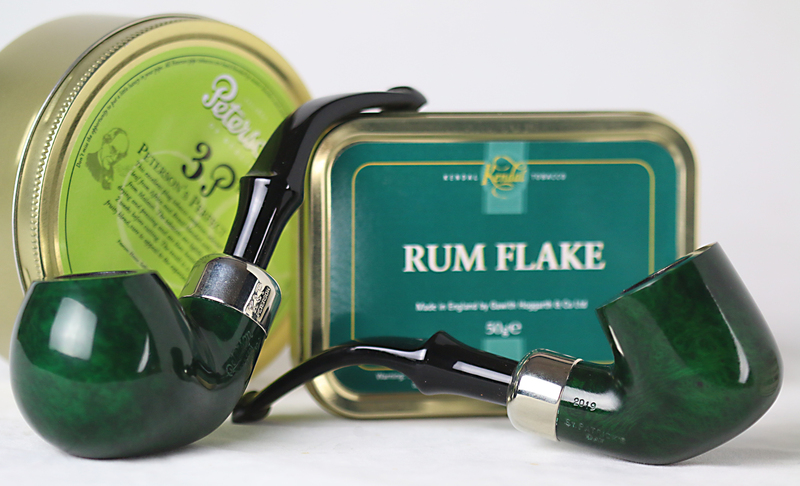 The past year or so has been a little difficult for some pipe smokers. Do you remember where you were when you heard McClelland was shutting down? How many seconds did it take for you to hit the speed dial to your favorite tobacconist? As usual, as I was one of the last to know and so missed out on the feeding frenzy, but I remember it hit me quite viscerally, about 11:30 in the morning. I was teaching a class of 8th graders and had to step out of the room and “take a moment,” as they say. My students were just asking me if they needed to dial 911 when I told them it would be alright, I just needed to take a few more deep breaths. And now, as I’m sure you’ve probably heard, it looks like Pipes & Tobaccos magazine will be folding up shop after 23 glorious years of continuous publication. Something to do with the way advertising is done nowadays. Something about “people don’t read anymore.” Something about a dystopian plot to destroy the pipe smoking world that makes Fahrenheit 451 look like Captain Kangaroo (don’t tell me you don’t know who he is, I don’t want to hear it). Then there was that moment last June when Tom Palmer said he had sold Peterson. What the Fridge? What does that even mean? I was relieved to hear who bought it, at least, although still pretty nervous. Well here we are about eight months later, and there’s some good news in the bleak days of late winter. You’re looking at it at the top of the page, and peppered all through this post. Laudisi is redeeming their promise to steward Peterson, and here’s the second installment. 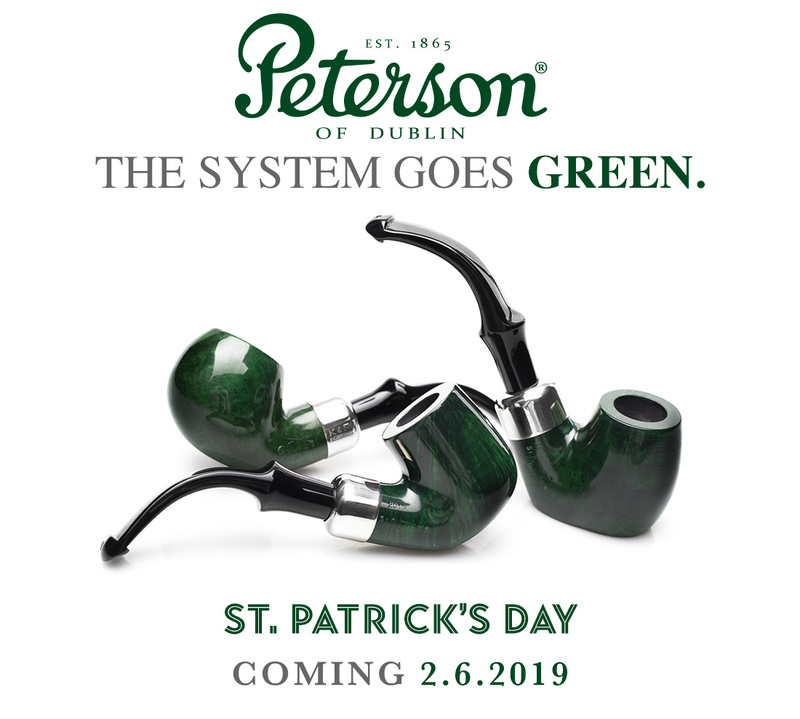 I’ll talk about the first one a little later, but right now let’s focus on the Laudisi Era’s first St. Patrick’s Day pipe—a System! It was long-time Peterson staffer Glen Whelan (Tony Whelan’s son) who had the idea, according to managing director Joshua Burgess. 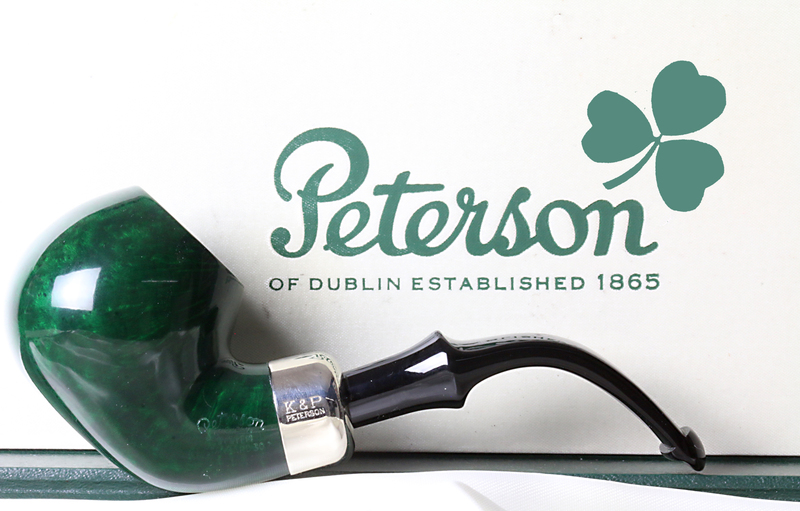 Glen was also in on the creation of the Founder’s Edition pipe back in 2016 (the D18 Oom Paul) and is an established part of the creative team there, having worked in the Dublin shop as well as in Peterson management for a long time now. Shapes? 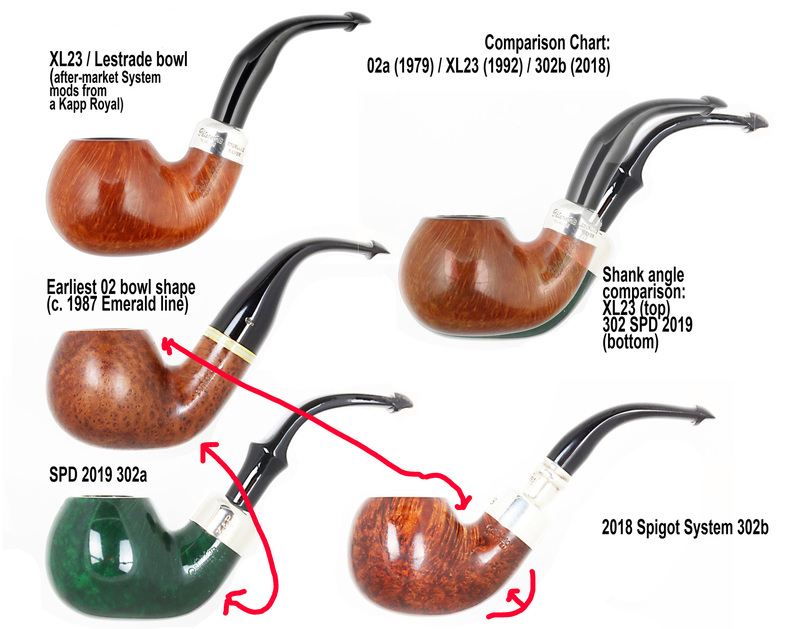 The SPD 2019 System is being offered in nine System shapes: the 301 pot, 302 large apple, 303 apple, 304 flat-bottom, 305 calabash, 307 large billiard, 312 medium billiard, 313 small dutch and 314 small billiard. That’s pretty most of the System range, apart from the 306 Flat Bottom, the tiny 317 billiard, the B42 / Darwin and the bent House Pipe. 1. 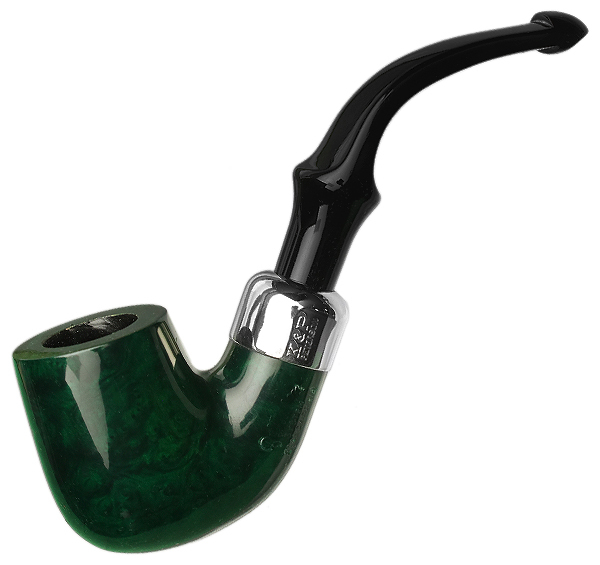 The Lestrade is a larger pipe–both wider and rounder than the 302. 2. The Lestrade is more bottom heavy than the 302, with a pronounced taper as it moves up toward the rim. 3. 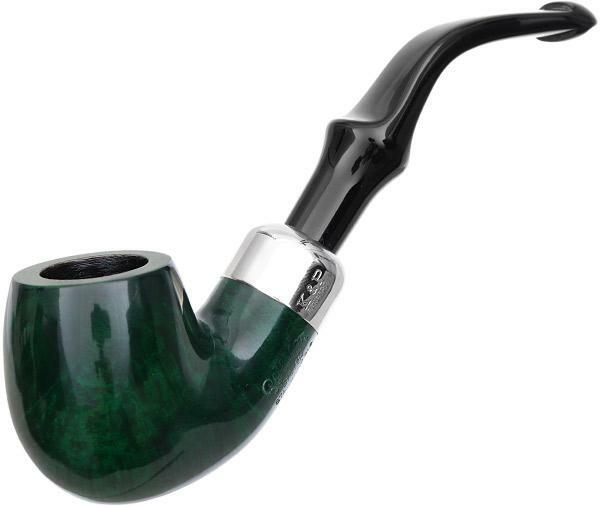 The shank of the Lestrade is set at a much steeper angle than the shank of the 302. Charles speculates–and this is just Charles before morning coffee–that there is either some difference in the way the 02 bowls are sanded, or might in fact be two bowls, a 302a and a 302b, coming from different suppliers. The 302a seen above is what threw me–the back base of the stummel reminded me of an XL23. The shank angles are obviously different, but the wider, rounder, more bottom heavy design of the XL23 can also be seen. 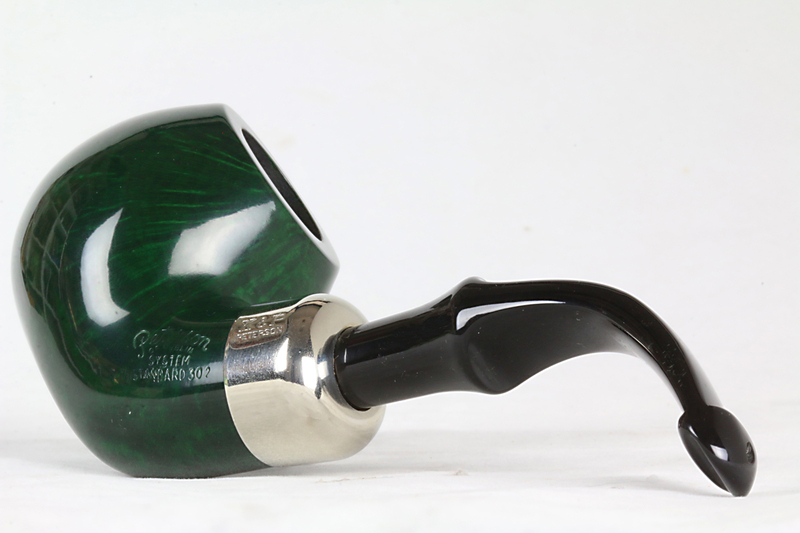 What I’m calling the 302b shape, seen on the Spigot System above, is the shape I’ve see on most of the 302 bowls in the current production lines of the past several years, although if you scroll through the Peterson pages at Smokingpipes, you’ll see a few of these 302a shapes. Charles also points out the shallower-longing crown, if you follow the red line from the Emerald 02 to the Spigot System. Finish? Last year’s finish was green, as seems to have become de rigueur for the SPD releases, but this year’s is gloss (it was matte last year). And as usual, on some pieces you will see a bit more grain showing through than on others. Stamps? On the stamping. 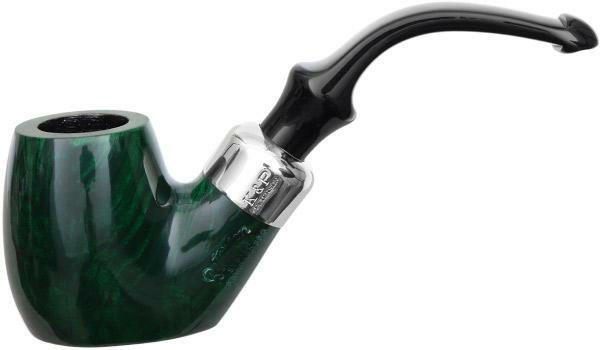 Joshua Burgess is determined to return Peterson, as soon as possible, to all hand-stamped pipes, and here we go: the SPD 2019 has all the information a Pete Geek needs to date it. The obverse side of the bowl is stamped with the Peterson in script over OF DUBLIN in small caps, with the all-important SYSTEM stamp beneath. 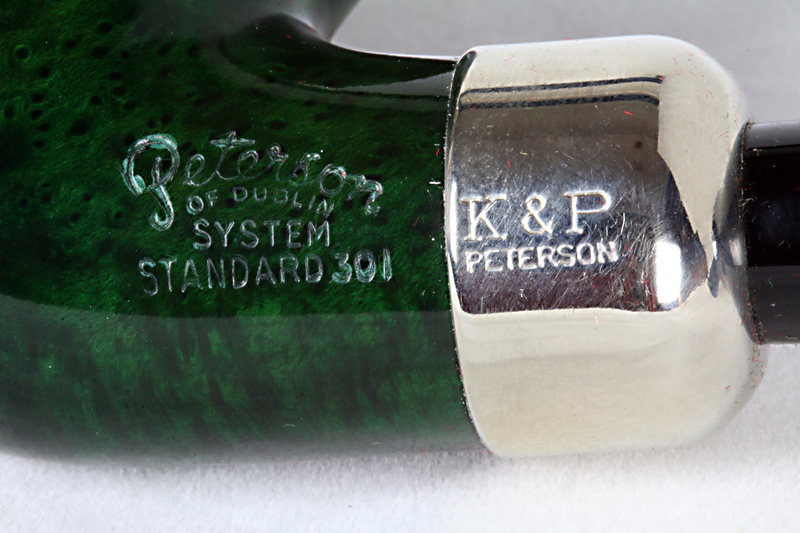 The nickel band has the traditional Peterson’s nickel maker’s mark: K&P in caps over PETERSON in small caps (now if we could get the addition of the nickel-mount “faux-marks” of shamrock, wolf hound and round tower as a permanent feature). 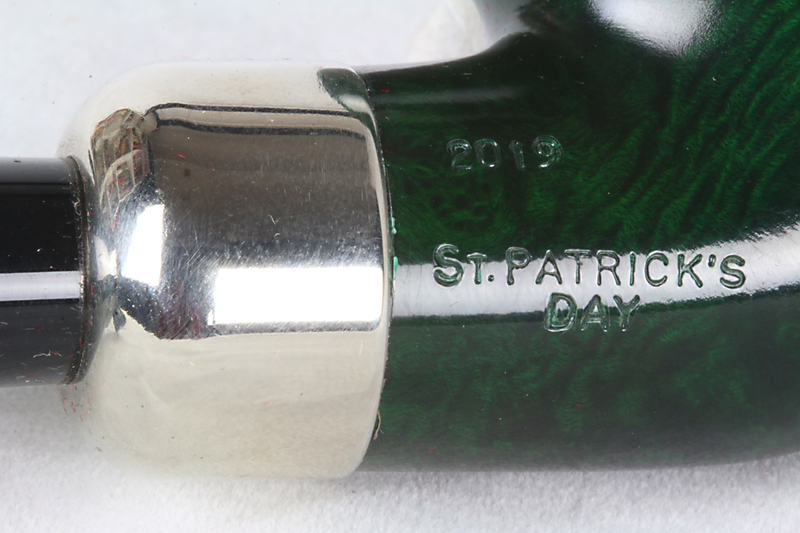 The reverse stamp has the year—2019—over ST. PATRICK’S over DAY in caps. A no-prize if you can tell me how many years of the SPD had no date on them (no fair looking on the blog). Mouthpiece? It’s the acrylic P-Lip I first came to love on the Next-Gen “picking stock” System from the IPCPR a few years back, which I also enjoy on a 312 Rogha System. It may not be the aesthetic equivalent of the great vulcanite P-Lips of yesteryear (before the mid-90s, anyway), but it actually performs just as well, in addition to having the benefit of no oxidation. It owes its excellence to the sharp shelving of the P-Lip. 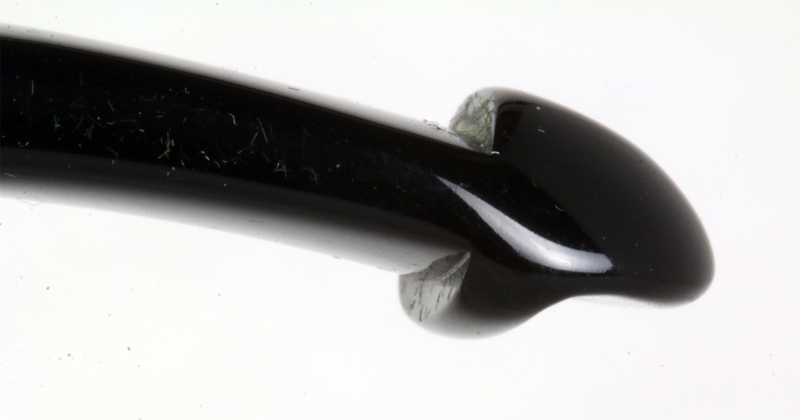 The fit between mortise and mouthpiece on a System mouthpiece needs to be tight—that’s crucial for correct airflow in the System—and on the 301 and “302” / XL23 I’ve been given the opportunity to examine, the acrylic seems to cinch up pretty well, although it has a slight tendency to unseat itself that vulcanite doesn’t. Mount? It’s a nickel mount, and yeah, I would’ve liked sterling, but I’m content. It’s not every day a new entry in the System line comes along (okay, there was the Spigot System last year). In fact, as the book documents, there have been about a half dozen or so special System lines–but I’ll leave that for the book. Cost? Just a bit more than a Standard System–about $105 or so. Caveat: This is probably the only time in Peterson’s history that we’ll see an SPD System. That being said, do yourself a favor and honor the System! 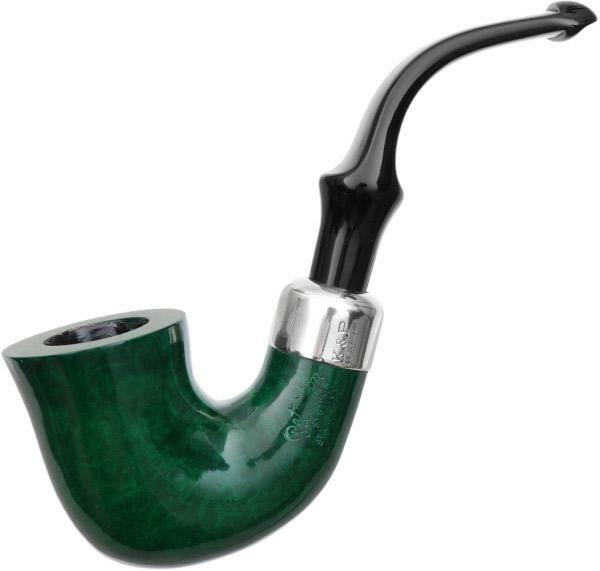 What I mean is that Charles Peterson worked hard to figure out how to get the pipe smoker 1) less tongue bite, 2) a dry smoke and 3) an easy clench. Buy a P-Lip. Remember: it’s not a System without it, it’s just a poorly-functioning army-mount. 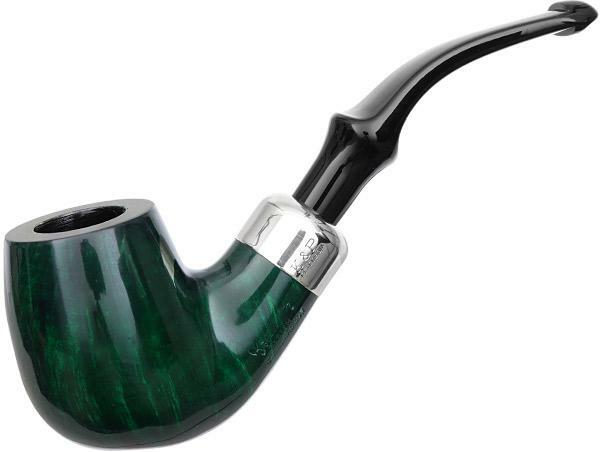 I don’t have anything against army mounts, but if you want to smoke one, don’t buy a pipe with a reservoir! 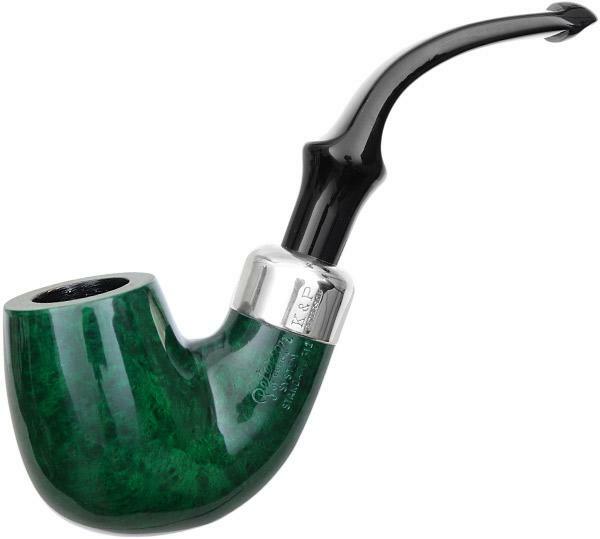 If you’re not familiar with them, you may sometimes think your Classic Range pipe has been bored with a reservoir when it hasn’t. 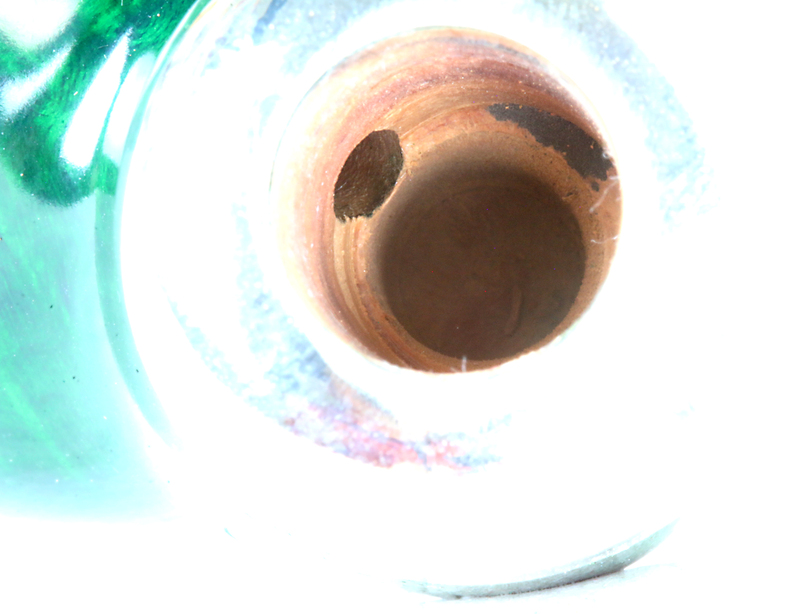 Look at the following example of a System reservoir: notice the well descending below the draft hole. In a Classic Range, the bore will be there, but stops right below the air hole, making a flat shelf with a slight dimple in the middle, but it doesn’t continue down into the shadow region seen below.